~ Eat Well. Run Often. Be Happy. Yesterday, I woke up and did what I always do, check the news. Unbelievable. A bomb. At a marathon. What kind of fucked up is that? My first thought was, who would target runners? Then I realised, the injured and killed were spectators (correct me if I am wrong….). Friends and family supporting people finishing one of life’s big achievements. It’s so many kinds of awful. There are already much more eloquent words out there expressing the thoughts we all have inside: our pain, our shock, our disbelief, our anger, our bewilderment. All I can say, is: Look after one another. Marathons. Ive seen two in the past two weeks, thanks Olympics!! I blogged about watching the womens here. I can’t get enough of it – here’s proof! Im reading two inspiring memoirs of running marathons, one is my favourite blog and the other is a book by one of Japans best authors. First the blog. If you have not already seen it I highly recommend Skinny Latte Strikes Back. Phillipa Moore is an amazing woman who has transformed her life and is now a fantastic athlete. I recently came across her blog whilst reading a running magazine, and was blown away at how she took control of her life and became fitter, healthier and happier. Her accounts of her first attempts at it, and the long hard slog to become a runner are brutally honest and truly inspiring. Her commitment to running is my favourite part of her blog, and I am living vicariously through her as she is beginning training to complete three half marathons in three weeks. She has already completed a marathon and other long distance races, so this should be a breeze for her. Cant wait to see how she goes…. 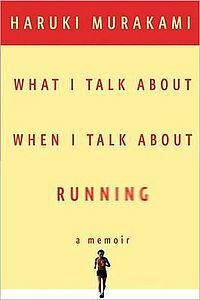 The book is called ‘What I Talk About When I Talk About Running’, by Haruki Murukami. Murukami wrote 1Q84, which is one of my favourite books. I often read translations of books that are written in different languages as I love the tension and the unusual intonation that can creep in when there are no direct substitutes for words in the original language. 1Q84 resonates with me as I lived in Japan for a time in my early 20s. Reading the book, I was taken back to the full immersion into the Japanese life that I occupied. His memoir about running shares that same tension and style. As well as being a fiction author, Murukami is a long distance runner, having competed in Marathons and Ultra Marathons since taking up running. His account of his first marathon length run, where he ran from Athens to Marathon is absolutely hilarious. I had tears in my eyes as I read it out to my husband. Read it for yourself, its a great book and it will make you want to get out there and run…. This book and Phillipa’s blog have me all fired up! I know that I have a long way to go, lets face it Im still unable to finish 5km. But there is this idea deep inside of me that I can do it too. I can run a marathon. Its as much about mental strength as physical – and if I can finish a PhD, then a marathon should be easy, right? Bring on the prep for next years long distance runs I have planned…..
Id love to hear if anyone else has this same urge, its on my mind all the time at the moment….